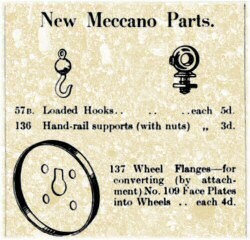 The Wheel Flange was introduced in the May 1922 Meccano Magazine, along with the Handrail Support. It was intended to be bolted to a Face Plate (part 109) to form a larger flanged wheel for trains. 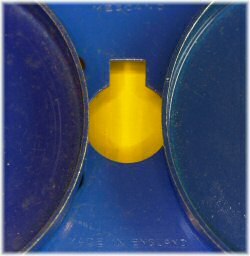 As well as four bolt holes, it has a central hole for the boss to pass through, and a square recess resembling those in stringing cards to allow a set screw to pass through the centre. In this way the Face Plate can be bolted either way around to the Wheel Flange. Four were supplied in outfit 7 of late 1924, obviously in order to make train driving wheels (as in the 1925 Manual model 715 "Locomotive and Tender"). This increased to ten in 1930 and the later outfit L, needed by model 7.16 and L13 "4-2-2 Locomotive and Tender". But in addition to this, one was supplied in the smaller outfit 6. It appears almost invisibly in the earlier 1924 manual model 627 "Automatic Weighing Crane". 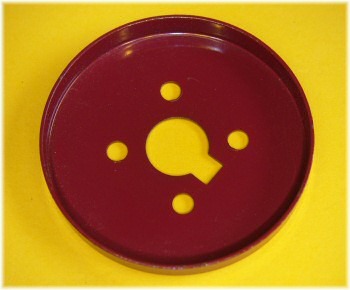 In this model, the Wheel Flange is to be bolted to a 3" pulley and the space around the edge filled with 3/8" balls in order to make a smooth roller bearing. We are used to this in the post-war outfit 9. In 1924, however, the balls were not supplied with the outfit and a rather weak mention is made that the balls "may be obtained separately" and yet "the crane will work well without the ball bearing". There is no explanation or picture showing where the Wheel Flange goes – the only mention is in the parts listing. This must have confused a few Meccano boys! Clive Weston has reminded me to point out that the Wheel Flange in fact makes the tread of a wheel – the flange is the Face Plate! More importantly, it wouldn't have fitted the new 3" pulleys anyway, as by this time they had had their bosses increased to ½'' diameter. The manual model might well have been made with earlier 3/8'' bossed pulleys. Either way, the Wheel Flange was very soon changed to have a half-inch hole in the centre, thus allowing it to be fixed to the 3" pulley and the larger Sprocket Wheels too. 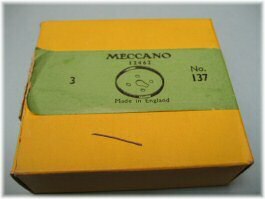 We can't date this exactly, but it is obviously after the announcement picture in the Meccano Magazine shown above and before the note in the October 1926 Meccano Magazine where it is mentioned that "The centre... is perforated to fit over the boss of a 3" Pulley Wheel". We can see that the part had the larger centre by this time. Small-hole nickel part 137 are few and far between. Unusually, this part changed from light red to blue in 1958 (so it matched the 3" pulleys but not the light red and later black Face Plates), and then to zinc plate in 1970 (so it wouldn't match either!). This strange colour sequence is not well documented in most existing literature. It's interesting to note how similar the 1932-33 Royal Blue is to the 1978-79 Dark Blue in the photo to the right comparing the three blues. The pre-war blue is very slightly more purple and intense, but the difference is not substantial. The photograph shows more difference than is obvious to the naked eye, although usually the condition of the part is the bigger giveaway. Dark Blue parts are stamped Made in England, of course. 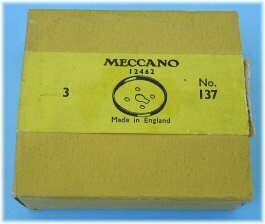 This image is taken from the original set of Meccano blueprints used by the factory. on www.meccanoindex.co.nz by clicking on the link in the text. I don't know whether we can identify this tiny increase in the blank size, particularly as the nominal depth of the part seems to be unchanged at 19/64''. Perhaps a little measuring might be in order, if you can't sleep. The original blueprints for this part can be seen by clicking here. To the left above, a box of three Wheel Flanges dating from between 1954 and 1957, in medium red. To the right, another set from the later period between 1958 and the early 60s. Note that this box has the light green label indicating the colour change, which is to blue (not light red or light green!). 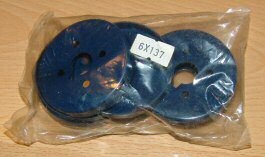 To the right is a bag of dark blue Wheel Flanges in the very last style of UK packaging, thought to be 1980-81. Do you have a 1950. transformer. the one I have in mind is a heavy bakalight one with 2 push buttons on the top to take the wires. As I mentioned in the flanged wheel department the tread on a railway wheel is conical not flat. Flat treads do not work on railways - even model railways, so it is not possible to make a Meccano railway vehicle with proper wheels. Funny that Meccano who made Hornby Trains with proper wheels didn't supply a Meccano wheel for railway vehicles. Or am I just being pedantic? I think that you ought to point out that, although part 137 converts a faceplate into a flanged wheel, it actually provides the tread of the completed wheel.